Please note. If you find this page, it is a draft under development and will not be finished until later in 2018. March 2018. More maps (and a song) added. When clicked, maps will now open full sized in a pop up light box window thingy. In the early years of skiing, most maps for skiers were produced by individuals, ski clubs and magazines. However for the past 60 years lift companies have produced maps for their customers and these maps comprise the majority on this site. Other maps are reproduced from magazines, books and brochures and these have been attributed to the original publishers. Dating some of the older maps can be difficult. If a map doesn't include a year, the date attributed to it on the caption is based on when ski lifts were built and removed, what buildings are shown and the resort logos featured on the maps. Three types of maps have been included, ski run maps, cross country ski maps and village maps. Most are official resort maps but where maps from other sources have been included, a brief note on their origin is attached. To avoid repetition, only maps that show infrastructure that has changed from previous years have been included, so there may be gaps of several years between maps of a resort. So if there was no change in infrastructure at a resort (such as lifts or snow making areas) then not every year is shown. As resort maps usually don't change from year to year, only maps that show changed infrastructure such as lifts or snow making areas have been included. However differing interpretations from different artists have been included, even when there is no change in infrastructure. History. The mountain became a ski destination from the early 1930s, lifts were built at the resort from the early 1960s. The resort became increasingly popular after a road was built up spectacular Jacobs Ladder in the early 1960s. Today. The small resort has seven surface lifts, a pub, a ski hire / cafe and while it receives many day visitors from nearby Launceston, there are hundreds of beds in lodges on the mountain. Both the lift company and the pub are for sale and the future of the resort will remain unlnown until these are resoled. 2005. Map from Robert Upe & Jim Darby. The snow guide to Australia and New Zealand. Explore Australia Publishing, 2005. 1983. From Australian skiing: a complete handbook. Edited by Wendy Cross & Peter Beilby. 4 Seasons, 1983. Circa 1938. Map by Reg Hall and G. Tyson. 2008 map by James Niehues [link to his website] showing new subdivision at left. 1962?. The last year the Dogpatch nutcracker tow ran beside the new Summit T-bar. 1961 showing existing and former lifts. Circa 1960. Reproduced from Julian Newton Brown. Falls Creek: how it came to be. p.8. 2015 cross country ski trail map. Skiing at Lake Mountain was briefly popular in the 1930s and experienced a minor revival in the 1950s, but it was not until the 1970s with increasing interest in cross country skiing, that the area became a popular destination. Infrastructure was gradually improved, but almost everything was burnt in the catastrophic 2009 wild fires. Important buildings were quickly rebuilt and with the recovery of both infrastructure and the landscape, Lake Mountain has consolidated its position as Australia's busiest cross country ski destination. Lake Mountain is a cross country ski resort north east of Melbourne near the town of Marysville. Despite limited popularity in the 1930s and in the early 1950s, the mountain only became a recognised ski destination in the 1970s. It is the nearest ski destination to Melbourne and its cross country ski trails are popular every weekend there is decent snow. 2014 topographic map of the Lake Mountain area. 1983 map when the lift network was at it's greatest extent. Preserved at Kellys Cafe. 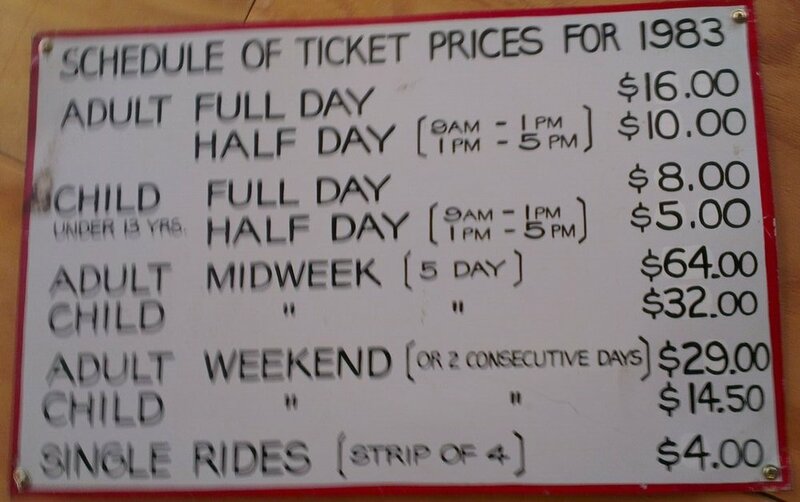 1983 Baw Baw ticket prices. Preserved at Kellys Cafe. 2005. The last map for Buffalo before it closed permanently at the end of the 2006 season. The first skiers ventured on to Buller in 1925 and for the next few years they stayed in rough huts. Things changed in 1929 with the construction of the Buller Chalet. It was instantly successful and was extended several times culminating in 80 beds after work in 1939. Sadly the Chalet burnt down in 1942, but Buller held a great attraction for skiers and after the end of World War II in 1945, three clubs were given permission to build lodges. But demand was so great that an unauthorised community of rough huts, caravans and at least one lodge were hidden in the scrub. The authorities dealt with this problem by opening up a subdivision in the summer of 1948 - 49. All 21 sites were immediately snapped up by ski clubs and despite further releases of land over the last 70 years, the supply has never kept up with demand for building sites at Buller. Today Mt Donna Buang is a family snow play destination with a toboggan slope, a lookout tower and a couple of nondescript buildings. But a few reminders of its heyday are hidden in the forest among the beech trees. Circa 1965. Jacks Tow may not have been as long as shown. 1953. The lines indicate named ski runs. Blue Ribbon was the only ski tow. c. 1930. 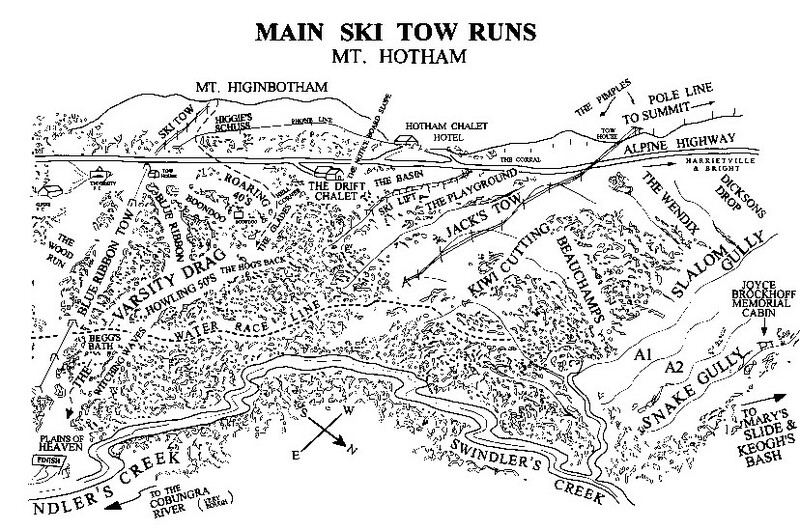 The Varsity Drag ski run near Blue Ribbon, a popular sheltered run below the treeline in the early days of Hotham. While the run was popular with members of the University Ski Club, it was almost certainly named after a popular song from the 1927 musical Good news. Varsity Drag was frequently played on the wireless (radio) and apparently there was a gramophone record of it at Hotham Heights. The name of the hit song was soon transfered to this ski run. There are many later versions available, but this is the only 1920s recording on line and is what the skiers who named Varsity Drag would have listened to. 2015. Interactive map. When opened headings on the left zoom to the area and provide a description. North west of New Norfolk in southern Tasmania. It is 1½ hours drive from Hobart. Recreational skiers first visited in the mid 1920s and in 1927 the Ski Club of Tasmania erected a 'clubhouse' at Twilight Tarn, making it the first club owned ski lodge in Australia. Interest in the area picked up after the road was extended to Lake Dobson. By the late 1940s Hobart skiers were tired of the unreliable snow on Mt Wellington and in the following years several city based clubs built lodges at Lake Dobson. Commercial development made an appearance in 1958 when Harold Cuming moved from Mt Buller and built a ski lift, however it burnt down in 1961. From 1963 members of the Southern Tasmanian Ski Association installed three nutcracker tows, including Rodway, the steepest surface lift in Australia. Another attempt at a business was made in the late 1960s when a beginners handle tow was installed and Sitzmark Lodge was built as a resort centre. However these facilities closed after about 25 years and Mt Mawson returned to a volunteer run club field. Mt Mawson is a 'club field' run by volunteers and is a bit of a throwback to the way mainland ski resorts operated in their early days. It consists of seven private lodges and three nutcracker tows that run on weekends when there is sufficient snow. It is under the control of the Southern Tasmanian Ski Association. The ski slopes are a 30 minute hike uphill from the car park at Lake Dobson. The lifts are the only Australian nutcracker tows open to the public. A day ticket is $30 (including nutcracker belt hire), regardless of how many tows are running. You should bring everything with you as ski hire and food outlets no longer operate. Mt Stirling was an occasional ski touring destination ever since skiers discovered neighbouring Mt Buller in the 1920s. In the late 1970s visitors began to come specifically to Stirling and the mountains popularity began to grow amongst cross country skiers. In the 1980s and 1990s two proposals were made to develop the mountain with ski lifts and accommodation. While they were opposed by a small but very vocal group of XC skiers, the proposals were probably not economic in the first place. The mountain is a fairly undeveloped cross country ski destination. Beyond the cafe and ski hire at Telephone Box Junction, the only infrastructure is a few shelter huts and ski trails cut through the Woollybutt and snowgum forests below the treeline. 2011. circa. Notes on reverse of trail map. 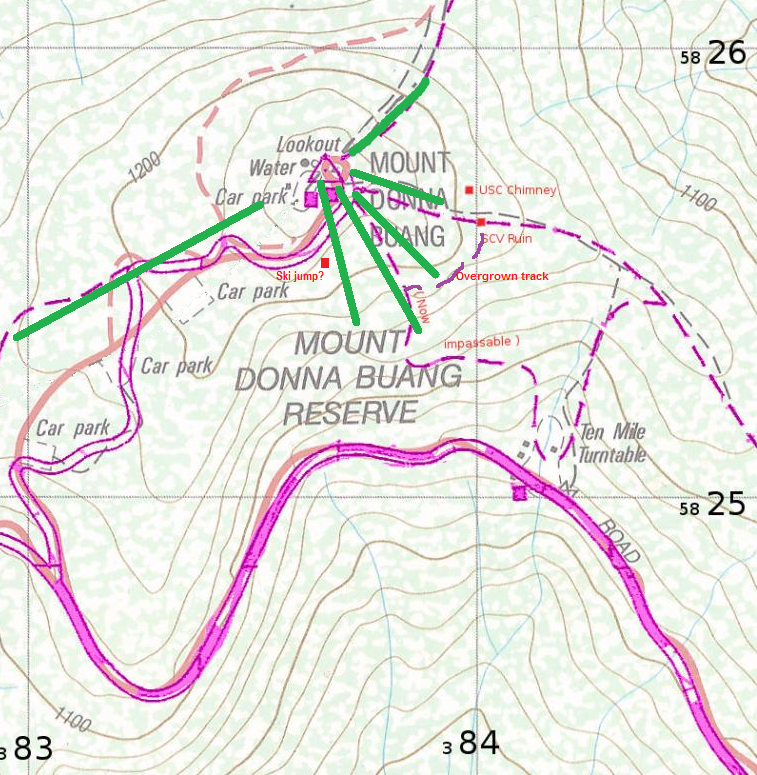 The 1983 proposal for a lift network on Mt Stirling. no lifts were ever built. 2011 showing the Guthega area. 2005. Guthega area. Map from Robert Upe & Jim Darby. The snow guide to Australia and New Zealand. Explore Australia Publishing, 2005. 1994. Blue Cow and Guthega. Medium resolution. 1992. Blue Cow and Guthega. Medium resolution. 1963. From a brochure promoting the new Australian Alpine Club lodge. 2016. No changes to the map, lifts or buildings, however the old logo has been removed from the map. 2010 claimed but check on triple chairlift dates. Trim line on right.